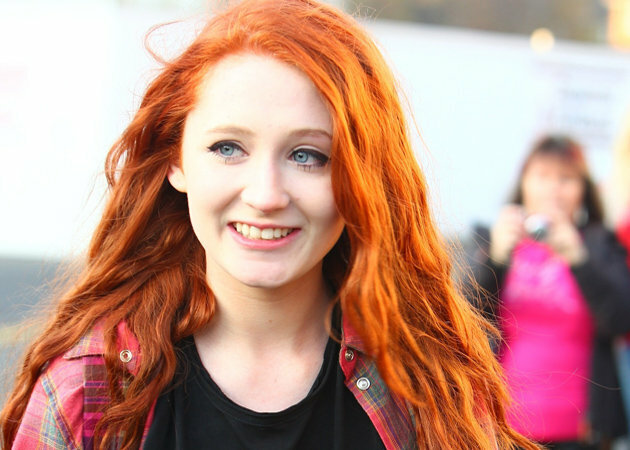 The usually sombre Janet Devlin finally seemed to have something to smile about last weekend – after being voted out of the hit TV show, the X factor! Much to the surprise of everyone, the usually timid 16 year old seemed incredibly chirpy after the news broke that she was to leave the popular singing contest. Janet, who famously caught the attention of the public with her awe-inspiring rendition of Elton John’s ‘Your Song’, appeared more relieved than devastated after the judges decided that she would be the next contestant to leave the show. Her departure took place after she found herself in the bottom two of the results, and was forced to battle the fierce Misha B in a tense sing-off. Shockingly, after the two girls had sung for survival, Kelly Rowland (who was mentor to both girls) chose to not vote for which girl should stay, ultimately resulting in Janet being booted out of the competition. However, the shy red-head seemed to display no hard feelings towards her mentor for her seeming betrayal, and instead openly smiled with relief at her chance to leave the show. Now that Janet has seemed to escape the ‘conventional’ pop-star making machine that is the X Factor, we only hope that the young star can use her unique talent to make music that will keep that new smile on her face! This entry was posted on Sunday, November 27th, 2011 at 10:06 pm	and is filed under Music News. You can follow any responses to this entry through the RSS 2.0 feed. Both comments and pings are currently closed.